Okieladybug's Scrap N' More: Diva's are back!! I was able to get another 6 Diva Va Voom cards done! Just two more sets of 6 and I will have 12 sets of Diva cards! I love the teapot Diva's *okie thinks that is a silly statement since she loves all the Diva's* but the colors were difficult to match, or at least time consuming. But I think I finally got the colors to where I liked them. I did do some tweaking to the teacup that I cut from Once Upon A Princess so it would match closely to the one in the image. I used Stardream Mica for the teacup so it would have a more porcelain look. I cut the top off of the top layer so I could have the white strip across the top of the teacup. The teabag tag is from Once Upon A Princess also. I would have added a staple if I could have found my stapler. 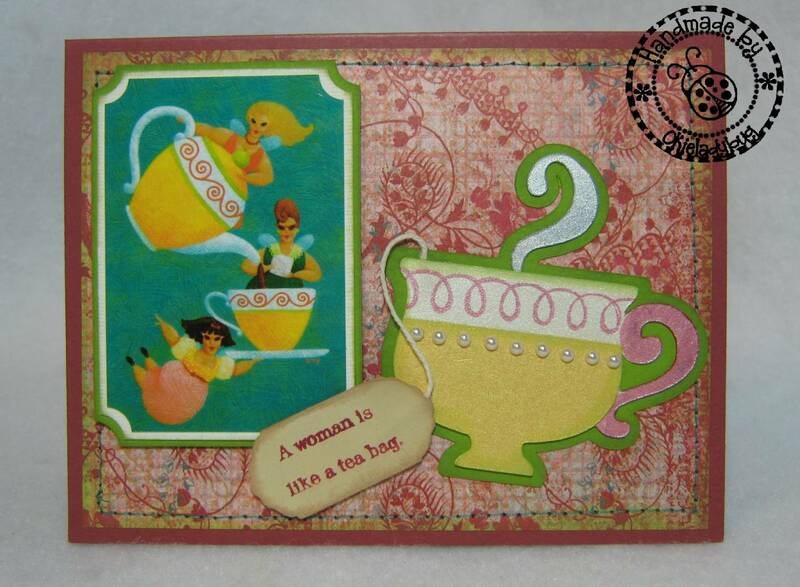 The sentiment is a Stampin Up! product. The loopy stamp on the teacup is a Studio G stamp. The ink for the stamping and on the handle is Stampin Up! Regal Rose, the steam is colored with a light grey Stampin Up marker. I used some small flat back pearls to embellish the teacup a little also. I used my Janome Sew-Mini to stitch around the edges of the card and just used a straight stitch. 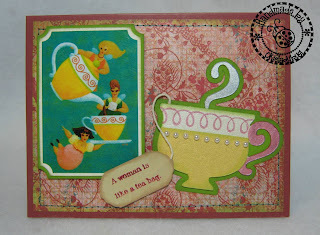 The corners of the image and mats were done with the Stampin Up! Ticket Punch. I used Perfect Layers to do the white and green mats, cutting at 1/8". I did use a marker to do the sentiment because of the room I had to work with I couldn't stamp the sentiment as a whole. This is another reason I love my Stampin Up! markers. It makes it easier to get the most use out of my stamps. I did cut the tag twice so I could glue the twine between the layers. I also glued the twine between the teacup and the shadow to make it look like it was hanging out of the teacup. I am hoping to get the other two Diva cards done this weekend so I can get the sets completed. I really think they will make great prizes at my Annual Girlfriend Christmas Party! This is wonderful. I am a big tea lover. 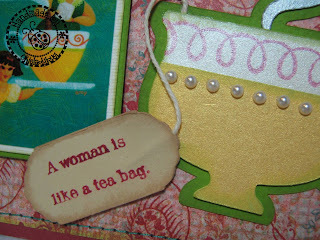 I really love that sentiment and the pretty pearls on the cup. These are going to be prizes at the girlfriends Christmas party that are going to cause a ruckus! Whoever wins them or buys them with your Santa bucks better hide them from the rest of us! Because we're all going to want them for ourselves! I wish I was going to be at the Christmas party, I would love to meet you and your friends and win all the cards, sounds like a load of fun! Love the cards they are great and so are you!!!! Lucky person to get these cards. Another great job. Thanks for sharing!